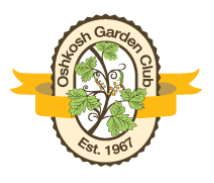 The Oshkosh Garden Club has sponsored a scholarship award program since 1983. High school seniors pursuing a career in horticulture, forestry, water management, agriculture, or other fields related to the preservation, beautification, or sustenance of the land are eligible for these awards. Scholarships are renewable for three additional years. Grace Hageman is a 2017 graduate of North High School. She is studying at Cornell University in the College of Agriculture and Life Sciences pursuing a degree in plant biology with a minor in entomology. Aristidis Giannopoulos is a 2018 graduate of Valley Christian School. He is a freshman at the University of Wisconsin-Madison pursuing a degree in biochemistry at the College of Agriculture and Life Sciences. Personal statement including extracurricular activities, vocational goals, hobbies, personal ambitions or anticipated problems. Application materials should be sent to Mrs. Alfred Sedlachek, 2800 Marine Dr., Oshkosh, WI 54901 by April 30.